At least that is what my mother would tell me. She would also tell me not to wear long skirts as they made me look short. What would she know?! I love playing with different styles and silhouettes, and whilst I love a floral dress for summer, in winter the jeans and boots tend to come out of storage. Having no idea what I wore last winter I decided that I needed some more winter tops in my wardrobe. The pattern is #122 from the 1/2008 issue of Burdastyle. I first came across this when visiting Marjorie who had made the blouse before (and incidentally has the best collection of Burda magazines ever!). I tried hers on and it fitted perfectly (with the exception of the sleeves being too long) and so borrowed her traced pattern. WIN! Or so I thought. Enter the Sewaway in Melbourne where I took this pattern as one of my (many) intended projects. I had carefully cut it before I left and I was ready to go. I dutifully sewed it up and then tried it on. Aaargh – it was way too big at the neck/shoulders. But why??? I had tried it on and it was perfect. Lightbulb moment – Marjorie’s was made with a cotton (maybe a voile? ), my fabric is rayon. Damn you rayon and your wonderful drape! I had to unpick the neckband and take 3″ (!!) out of the width. To solve this additional fabric issue, I added a centre box pleat. There was supposed to be a functioning placket but the box pleat made this tricky so I decided to make it a fake placket, as luckily I had not cut the vent yet. The buttons are vintage from my US trip last year. Then I guess it must have been getting late and I was getting tired. I realized I had got my sleeve bands and placket pieces mixed up and used a sleeve band for the placket. Gah! Of course the placket was too short to fit around my arm and I didn’t have any extra fabric as I had cut it out back in Brisbane and the scraps were long binned. Another hack job was on the cards. I used the two placket pieces to form the missing sleeve band. This just means one sleeve band has two joins instead of one. Pretty sure no one will notice and if they are looking that close I can just elbow them in the nose!! The blouse has some really interesting details. The sleeves have two pieces, an upper and lower sleeve. The upper sleeves extend across the back and join in the middle to form a yoke, but at the front join the bodice to form a raglan. There are pleats on the back and front which are stitched down approximately 3″ to control the fullness (and hopefully assist in avoiding the pregnant look). I have added 3″ to the pattern length, unusual for me since I am 5’2″, but the pattern is pretty short and I really wanted to avoid any potential tummy flashing!! Time for a close up, plus bonus peek to the inside which is predominantly French-seamed. 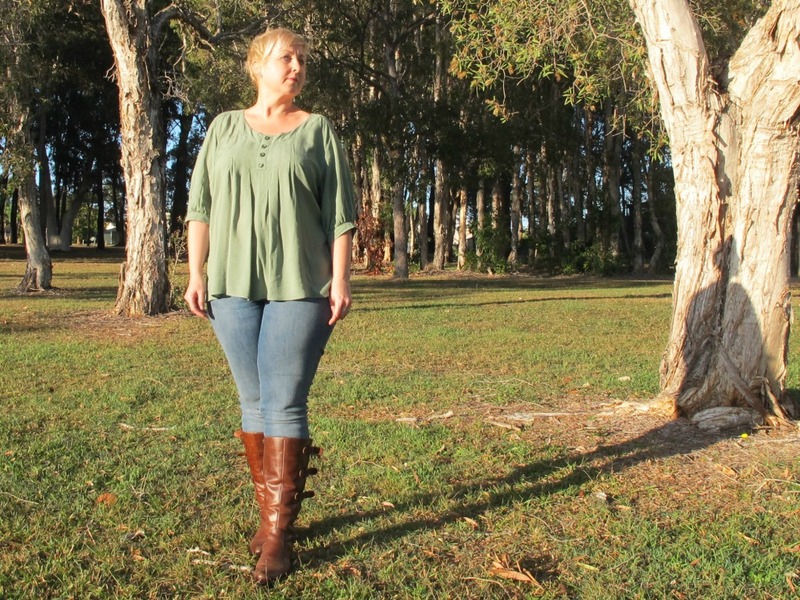 All construction issues aside, I absolutely love this blouse and it is perfect for our mild Brisbane winters. I feel like I am totally channeling Nina Proudman in this. I love this show so much – if you haven’t seen it, what are you waiting for?? I love most of Nina’s wardrobe, casual chic, not everyday, but it is fun to have in the mix. I love GOT – but yes the costumes are perhaps not for everyday! Absolutely visit East Coast, they are very hit and miss, but the Springwood store seems to have a pretty good range most of the time. I haven’t been to their other one. Yes that is very Nina! especially with the scarf and boots… boy I won’t be looking at that sleeve too closely. My friend visited the Maroochydore East Coast and said it was divine compared to the Springwood one! Ooh I must try the Maroochydore one! 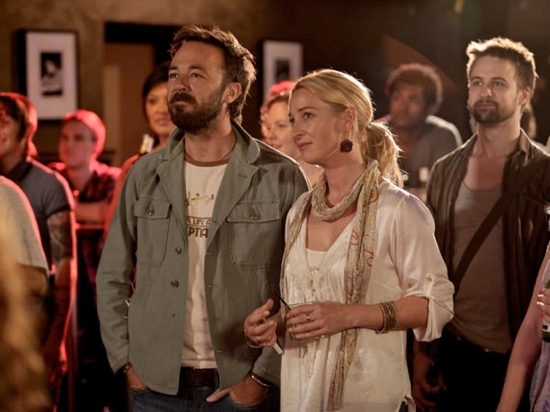 Nina Proudman would be proud….man! Lol couldn’t help myself. I love tops like this. The colour is perfect on you too. I think your top looks beautiful Liz and I like the drape of the rayon. I did heavily interface my neck line but I still think the Liberty Lawn that I used, stopped the neck line widening. You can see my version on BurdaStyle uner member : Schnui and my is called “sporty floral polo top”. Don’t ask me how I came up with that name!!! Was it Liberty Lawn you used? For some reason I had it in my head as being white, perhaps it is because I imagined it for me in white. On checking yours on BurdaStyle I now remember. Great top Lizzie Proudman! I think the colour is great and this is just the sort of boho chic I can see Nina swanning about it down in Melbs. Thanks Mel, swanning about, that’s totally what I need to be doing!!! Liz! I love this. Gorgeous shape, great color and those details are especially pretty. Also loving it with jeans + boots + scarf combo. Hahahaha, rules are made to be broken! I wear green with blue jeans all the time. 🙂 I am always so impressed by your tenacity with making patterns work. You always seem to come up with a clever fix! Great job! I have never heard that saying before. Blue and green are my two favorite color combos! Making it work Liz! This is lovely, and even lovelier in the flesh 🙂 The drape and colour are both beautiful on you. Thanks Helen, I love to wear it. Next up a white one, then maybe polka dots!! Gah to the blue/green thing – I think these colours are made to go together. Love the top too. Liz, I love that green rayon and I think it looks great with blue! The blouse is lovely and styled very Nina. I was just thinking how much I love her wardrobe. Mwah ha ha!!! I can take you to the house of fabulousness (East Coast Fabrics) if you have time when you are up here later in the year? I love how you’re proving your mother wrong, I like to prove mine wrong too! 😉 Your top is lovely, it looks great with the scarf, and I admire your perseverance with all the issues. love your shirt.. so cute.. Looks great with your jeans.. Happy sewing. Very pretty top with a lovely drape. I have moved to a rental whilst we build so change of scenery. The show is great, it is Australian and based in a maternity hospital, but it’s not about babies. It’s really well written and very good. Totally Nina! I could do with something similar in my wardrobe. I love blue and green and my Mum told me the same thing. I have no idea why! Maybe depends on the shade, I guess some wouldn’t go together too well?